These are my 4 year old triplets. 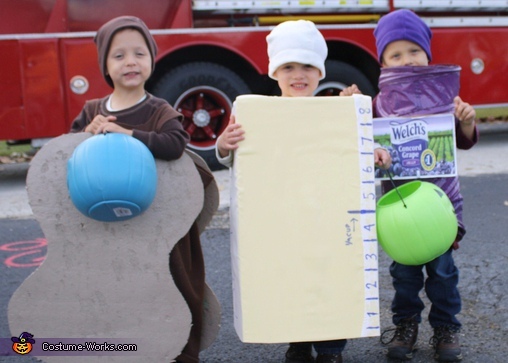 They went as their favorite food...peanut butter & jelly! Mom & Dad made the costumes. Peanut was backerboard from our vinyl siding painted with brown fleece inside to hold it up. Butter was a cardboard box painted yellow with cheesecloth around it. Jelly was a cat tunnel painted purple with a Welch's label enlarged and printed.